Our clients can avail from us wide range of heat transfer of laboratory which include heat conduction in solid, heat conduction in glasses and liquids, shell and tube exchanger. All these equipment are highly capable and offered at market leading rates. Chemical Reaction Engineering Lab, Heat Transfer Equipments Suppliers, Heat Transfer Lab Instruments India, Heat Transfer Lab Equipments Manufacturers, Heat Transfer Lab Equipments Exporters India, Heat Transfer Labs Equipments, advanced technocracy inc. In an ideal CSTR (i.e. an ideal steady state flow reactor) the contents in reactor are well mixed and have uniform composition throughout. Thus the exit stream has the same composition as the fluid within the reactor. This type of reactor is known as mixed flow reactor. This set-up is used to study a non-catalytic homogeneous second order liquid phase reaction under isothermal condition. The set up consists of two feed tanks through which two reactants are fed to the reactor. The flow rate can be varied by changing the speed of peristaltic pump. The CSTR is fitted with stirrer for proper mixing. 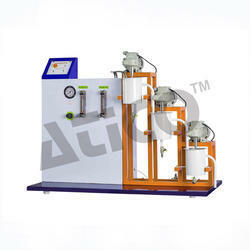 Constant temperature water bath arrangement is provided to conduct the experiment at various temperatures. Saponification Reaction study in Isothermal CSTR. To determine the Reaction Rate Constant and effect of temperature on it. Instruments, Laboratory Glassware and Chemicals required for analysis as per the system adopted. Computer System: i-3 processor with DVD Drive, Windows 7/8, MS-Office pre-loaded. One USB slot required in PC for Data Acquisition Card. In an ideal CSTR (i.e. an ideal steady state flow reactor) the contents in reactor are well mixed and have uniform composition throughout. Thus the exit stream has the same composition as the fluid within the reactor. This type of reactor is known as mixed flow reactor. This set-up is used to study a non-catalytic homogeneous second order liquid phase reaction under isothermal condition. The set up consists of two feed tanks through which two reactants are fed to the reactor. Peristaltic Pumps are provided to measure the individual flow of Chemicals. The CSTR is fitted with stirrer for proper mixing. From top outlet of it samples are collected for analysis. Constant temperature water bath arrangement is provided to conduct the experiment at various temperatures. Voltage (V) less than 5 volts. In an ideal CSTR (i.e. an ideal steady state flow reactor) the contents in reactor are well mixed and have uniform composition throughout. Thus the exit stream has the same composition as the fluid within the reactor. This type of reactor is known as mixed flow reactor. This set-up is used to study a non-catalytic homogeneous second order liquid phase reaction under isothermal condition. The set up consists of two overhead feed tanks through which two reactants are fed to the reactor. Rotameters are provided to measure the individual flow of Chemicals. The flow rate can be adjusted by operating the needle valves provided on respective Rotameter. The CSTR is fitted with stirrer for proper mixing. From top outlet of it samples are collected for analysis. 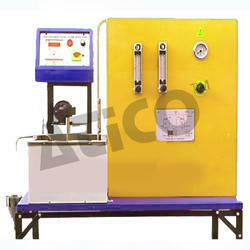 Constant temperature water bath arrangement is provided to conduct the experiment at various temperatures. Electricity Supply: Single Phase, 220 V AC, 50 Hz, 5-15 Amp combined socket with earth connection. Earth voltage should be less than 5 volts. In an ideal CSTR (i.e. an ideal steady state flow reactor) the contents in reactor This set-up is used to study a non-catalytic homogeneous second order liquid phase reaction under ambient condition. The setup consists of three CSTR arranged in series and two feed tanks through which two reactants are fed to the reactor. Rotameters are provided to measure the individual flow of Chemicals. The flow rate can be adjusted by operating the needle valves provided on respective Rotameter. The compressed air is used for circulation of feed. Reactants from feed tanks enter in the first CSTR and are passed to second CSTR and so on. For analysis samples are collected from different ports provided. Pressure Regulator, Pressure Gauge and Safety Valve are fitted in the compressed air line. To study the performance of Cascade of three equal volumes CSTR's in series for the sponification of a reaction. To draw the performance chart for the reactor system and evaluate the reaction rate constant at ambient condition.. In an ideal CSTR (i.e. an ideal steady state flow reactor) the contents in reactor This set-up is used to study a non-catalytic homogeneous second order liquid phase reaction under ambient condition. The setup consists of three CSTR arranged in series and two feed tanks through which two reactants are fed to the reactor. The flow rate can be varied by changing the speed of peristaltic pump. Reactants from feed tanks enter in the first CSTR and are passed to second CSTR and so on. For analysis samples are collected from different ports provided. To draw the performance chart for the reactor system and evaluate the reaction rate constant at ambient condition. In an ideal CSTR (i.e. an ideal steady state flow reactor) the contents in reactor This set-up is used to study a non-catalytic homogeneous second order liquid phase reaction under ambient condition. The setup consists of three CSTR arranged in series and two feed tanks through which two reactants are fed to the reactor. The flow rate can be varied by changing the speed of peristaltic pump. Reactants from feed tanks enter in the first CSTR and are passed to second CSTR and so on. To study the performance of Cascade of three equal volumes CSTR's in series for the saponification of a reaction. slot required in PC for Data Acquisition Card. In an ideal CSTR (i.e. an ideal steady state flow reactor) the contents in reactor are well mixed and have uniform composition throughout. Thus the exit stream has the same composition as the fluid within the reactor. This type of reactor is known as mixed flow reactor. This set-up is used to study a non-catalytic homogeneous second order liquid phase reaction under ambient condition. The set up consists of two feed tanks through which two reactants are fed to the reactor. Peristaltic pumps are provided to measure the individual flow of Chemicals. The flow rate can be varied by changing the speed of peristaltic pump. The CSTR is fitted with stirrer for proper mixing. From top outlet of it samples are Collected For Analysis. In an ideal CSTR (i.e. an ideal steady state flow reactor) the contents in reactor are well mixed and have uniform composition throughout. Thus the exit stream has the same composition as the fluid within the reactor. This type of reactor is known as mixed flow reactor. This set-up is used to study a non-catalytic homogeneous second order liquid phase reaction under isothermal condition. The set up consists of two feed tanks through which two reactants are fed to the reactor. The flow rate can be varied by changing the speed of peristaltic pump. The CSTR is fitted with stirrer for proper mixing. From top outlet of it samples are collected for analysis. Constant temperature water bath arrangement is provided to conduct the experiment at various temperatures. In an ideal CSTR (i.e. an ideal steady state flow reactor) the contents in reactor are well mixed and have uniform composition throughout. Thus the exit stream has the same composition as the fluid within the reactor. This type of reactor is known as mixed flow reactor. This set-up is used to study a non-catalytic homogeneous second order liquid phase reaction under ambient condition. The set up consists of two feed tanks through which two reactants are fed to the reactor. Rotameters are provided to measure the individual flow of Chemicals. The flow rate can be adjusted by operating the needle valves provided on respective Rotameter. The compressed air is used for circulation of feed. The CSTR is fitted with stirrer for proper mixing. From top outlet of it samples are collected for analysis. Pressure Regulator, Pressure Gauge and Safety Valve are fitted in the compressed air line. To study the progress of a suitable Chemical Reaction in CSTR. Voltage (Volt) less than 5 volts. In an ideal CSTR (i.e. an ideal steady state flow reactor) the contents in reactor This set-up is used to study a non-catalytic homogeneous second order liquid phase reaction under ambient condition. The setup consists of three CSTR arranged in series and two overhead feed tanks through which two reactants are fed to the reactor. Over head tanks are used for circulation of feed. Reactants from feed tanks enter in the first CSTR and are passed to second CSTR and so on. For analysis samples are collected from different ports provided. Rotameters are provided to measure the individual flow of Chemicals. The flow rate can be adjusted by operating the needle valves provided on respective Rotameter. Real reactors do not satisfy the idealized flow patterns, back mix flow or plug flow deviation from ideality can be due to channeling of fluid through the vessel, recycling of fluid within the vessel or due to the presence of stagnant region or pockets of fluid in the vessel. To predict the exact behavior of a vessel as a Chemicals reactor, RTD or stimulus response technique is used. The flow rate can be varied by changing the speed of peristaltic pump. The continuously stirred tank reactor made of Stainless Steel is provided for understanding the R.T.D. characteristics. The setup consists of one feed tank through which water is fed to the reactor. In an ideal Plug Flow Reactor (PFTR) there is no mixing in the direction of flow and complete mixing perpendicular to direction of flow. Concentration of reactants varies along the length of reactor but not in radial direction. In case of a coil turbulence is introduced due to frequent change in direction of flow and presence of secondary flow, so a higher value of reaction rate constant is expected in coil tube type plug flow reactor. This set-up is used to study a non-catalytic homogeneous reaction under isothermal condition. Saponification Reaction study in Isothermal Plug Flow Reactor. To determine Reaction Rate Constant and effect of temperature on it. Compressed Air Supply: 0.5 CFM@1bar. Water Bath : Material Stainless Steel, Double wall insulated with Ceramic Wool. Feed Circulation : By compressed air. Piping : Stainless Steel and PU pipe. In an ideal Plug Flow Reactor (PFTR) there is no mixing in the direction of flow and complete mixing perpendicular to direction of flow. This set-up is used to study a non-catalytic homogeneous reaction under isothermal condition. The set up consists of two feed tanks through which two reactants are fed to the reactor. The flow rate can be varied by changing the speed of peristaltic pump. It is a helical coil tube type reactor kept in a constant temperature water bath to conduct the experiment at various temperatures. Concentration of reactants varies along the length of reactor but not in radial direction. In case of a coil turbulence is introduced due to frequent change in direction of flow and presence of secondary flow, so a higher value of reaction rate constant is expected in coil tube type plug flow reactor. Reactants enter at lower end coming out of the top of coil from where samples are collected for analysis. connection. Earth voltage should be less than 5 volts. 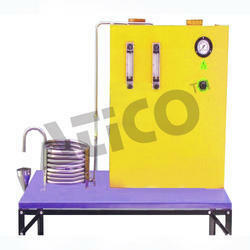 Water Bath : Material Stainless Steel, Double wall, insulated with Ceramic Wool. Piping : Stainless Steel and Silicon Pipe. In an ideal Plug Flow Reactor (PFTR) there is no mixing in the direction of flow and complete mixing perpendicular to direction of flow. Concentration of reactants varies along the length of reactor but not in radial direction. This set-up is used to study a non-catalytic homogeneous reaction under isothermal condition. In case of a coil turbulence is introduced due to frequent change in direction of flow and presence of secondary flow, so a higher value of reaction rate constant is expected in coil tube type plug flow reactor. The set up consists of two feed tanks through which two reactants are fed to the reactor. Peristaltic pumps are provided to measure the individual flow of Chemicals. The flow rate can be varied by changing the speed of peristaltic pump. Reactants enter at lower end coming out of the top of coil from where samples are collected for analysis. It is a helical coil tube type reactor kept in a constant temperature water bath to conduct the experiment at various temperatures. To determine Reaction Rate Constant and effect of temperature on it. .
Water Supply & Floor Drain. Computer System: i-3 processor with DVD Drive, Windows 7, MS-Office pre-loaded. One USB slot required in PC for Data Acquisition Card..
Feed Tank (2Nos.) : Material Stainless Steel, Capacity 20 Ltrs. Product Analysis : By Electronic Sensor (1No. ), Output 4-20 mA. The setup consists of one feed tank through which water is fed to the reactor. The flow rate can be adjusted by operating the needle valve and measured by Rotameter. The compressed air is used for circulation of feed. The continuously stirred tank reactor made of Stainless Steel is provided for understanding the R.T.D. characteristics. Pressure Regulator & Pressure Gauge are fitted in the compressed air line. Real reactors do not satisfy the idealized flow patterns, back mix flow or plug flow deviation from ideality can be due to channeling of fluid through the vessel, recycling of fluid within the vessel or due to the presence of stagnant region or pockets of fluid in the vessel. To predict the exact behaviour of a vessel as a Chemicals reactor, RTD or stimulus response technique is used. Compressed Air Supply at 2 Bar, 0.25 CFM. Floor Area Required:1 m x 0.75 m.
RTD Real reactors do not satisfy the idealized flow patterns, back mix flow or plug flow deviation from Real reactors do not satisfy the idealized flow patterns, back mix flow or plug flow deviation from ideality can be due to channeling of fluid through the vessel, recycling of fluid within the vessel or due to the presence of stagnant region or pockets of fluid in the vessel. To predict the exact behavior of a vessel as a Chemicals reactor, RTD or stimulus response technique is used. The flow rate can be adjusted by operating the needle valve and measured by Rotameter. The continuously stirred tank reactor made of Stainless Steel is provided for understanding the R.T.D. characteristics. The setup consists of overhead feed tank through which water is fed to the reactor. To plot RTD curve for a CSTR. Using pulse tracer. Real reactors do not satisfy the idealized flow patterns, back mix flow or plug flow deviation from ideality can be due to channeling of fluid through the vessel, recycling of fluid within the vessel or due to the presence of stagnant region or pockets of fluid in the vessel. The flow rate can be adjusted by operating the valve and measured by Peristaltic Pump. It is a helical coil tube type plug flow reactor made up of Stainless steel pipe. Reactants enter at lower end coming out of the top of coil from where samples are collected for analysis. For understanding the R.T.D. characteristics, a special arrangement to inject tracer into the lower end of reactor, using a syringe is provided. To predict the exact behaviour of a vessel as a Chemicals reactor, RTD or stimulus response technique is used. The setup consists of one feed tank through which water is fed to the reactor. Computer System: i3 processor with DVD Drive, Windows 7/8, MS-Office pre-loaded. One USB slot required in PC for Data Acquisition Card. Feed Tank : Material Stainless Steel, Capacity 20 Ltrs. Product Analysis : By using Electronic Sensor, Output 4-20 mA. The set up consists of two feed tanks through which two reactants are fed to the reactor. It is a helical coil tube type reactor. Rotameters are provided to measure the individual flow of Chemicals. The flow rate can be adjusted by operating the needle valves provided on respective Rotameter. The compressed air is used for circulation of feed. Samples are collected for analysis from the outlet of reactor. Pressure Regulator, Pressure Gauge and Safety Valve are fitted in the compressed air line. In an ideal Plug Flow Reactor (PFTR) there is no mixing in the direction of flow and complete mixing perpendicular to direction of flow. Concentration of reactants varies along the length of reactor but not in radial direction. This set-up is used to study a non-catalytic homogeneous reaction under ambient condition. Floor Area Required: 1 m x 0.75 m.
Reactor : Material Stainless Steel, Volume (0.6-0.7) Ltrs (approx.). Flow Measurement : Rotameter 2Nos. (One each for Reactants). The set up consists of two feed tanks through which two reactants are fed to the reactor. Rotameters are provided to measure the individual flow of Chemicals. The flow rate can be adjusted by operating the needle valves provided on respective Rotameter. The compressed air is used for circulation of feed. The CSTR is fitted with stirrer for proper mixing. From top outlet of it samples are collected for analysis. Constant temperature water bath arrangement is provided to conduct the experiment at various temperatures. Pressure Regulator, Pressure Gauge and Safety Valve are fitted in the compressed air line. In an ideal CSTR (i.e. an ideal steady state flow reactor) the contents in reactor are well mixed and have uniform composition throughout. Thus the exit stream has the same composition as the fluid within the reactor. This type of reactor is known as mixed flow reactor. This set-up is used to study a non-catalytic homogeneous second order liquid phase reaction under isothermal condition. Motor (One each for Water Bath and Reactor). Flow Measurement : Rotameter-2Nos. (One each for Reactants). RTD Real reactors do not satisfy the idealized flow patterns, back mix flow or plug flow deviation from ideality can be due to channeling of fluid through the vessel, recycling of fluid within the vessel or due to the presence of stagnant region or pockets of fluid in the vessel. To predict the exact behavior of a vessel as a Chemicals reactor, RTD or stimulus response technique is used. The setup consists of one feed tank through which water is fed to the reactor. The flow rate can be varied by changing the speed of peristaltic pump. This software is capable to tabulate the sample readings according to the requirement of experiment under study and results obtained can be compared. The present set-up has a facility to interface the system with computer which enables to log the experimental data using computer. The educational software and data-logging package has been developed for unit. The real time data acquisition can be done by interfacing the set-up with computer using software. Software allows the user to have control on data logging, printing the stored data, preparing spread sheets in Excel etc. Real reactors do not satisfy the idealized flow patterns, back mix flow or plug flow deviation from ideality can be due to channeling of fluid through the vessel, recycling of fluid within the vessel or due to the presence of stagnant region or pockets of fluid in the vessel. The setup consists of one feed tank through which water is fed to the reactor. Peristaltic pump is provided to circulate the water. To predict the exact behavior of a vessel as a Chemicals reactor, RTD or stimulus response technique is used. A straight tube type reactor kept horizontally and inclined upward at outlet from where samples are collected for analysis. For understanding the R.T.D. characteristics, a special arrangement to inject tracer into the lower end of reactor, using a syringe is provided..
Electricity Supply Single Phase, 220 V AC, 50 Hz, 5-15 Amp combined socket with earth connection. Earth voltage should be less than 5 volts. Flow Measurement Peristaltic Pumps- 1No. Real reactors do not satisfy the idealized flow patterns, back mix flow or plug flow deviation from ideality can be due to channeling of fluid through the vessel, recycling of fluid within the vessel or due to the presence of stagnant region or pockets of fluid in the vessel. To predict the exact behavior of a vessel as a Chemicals reactor, RTD or stimulus response technique is used. The setup consists of one overhead feed tank through which water is fed to the reactor. The overhead tank system is used for circulation of feed. It is a helical coil tube type plug flow reactor made up of Stainless steel pipe. Reactants enter at lower end coming out of the top of coil from where samples are collected for analysis. For understanding the R.T.D. characteristics, a special arrangement to inject tracer into the lower end of reactor, using a syringe is provided. Electricity Supply: Single Phase, 220 V AC, 50 Hz, 5-15 Amp combined socket with earth connection. Electricity supply: Single phase, 220 V AC, 50Hz, 5-15 Amp combined socket with earth connection. Flow Measurement : By Rotameter. Piping : Material Stainless Steel and PVC/PU pipe. Real reactors do not satisfy the idealized flow patterns, back mix flow or plug flow deviation from ideality can be due to channeling of fluid through the vessel, recycling of fluid within the vessel or due to the presence of stagnant region or pockets of fluid in the vessel. To predict the exact behavior of a vessel as a Chemicals reactor, RTD or stimulus response technique is used. The continuously stirred tank reactor made of Stainless Steel is provided for understanding the R.T.D. characteristics. This software package provides a comprehensive educational software environment within which the investigations can be performed. The setup consists of one feed tank through which water is fed to the reactor. The flow rate can be varied by changing the speed of peristaltic pump. This software is capable to tabulate the sample readings according to the requirement of experiment under study and results obtained can be compared. The present set-up has a facility to interface the system with computer which enables to log the experimental data using computer. The educational software and data-logging package has been developed for unit. The real time data acquisition can be done by interfacing the set-up with computer using software. Software allows the user to have control on data logging, printing the stored data, preparing spread sheets in Excel etc. In an ideal Plug Flow Reactor (PFTR) there is no mixing in the direction of flow and complete mixing perpendicular to direction of flow. This set-up is used to study a non-catalytic homogeneous reaction under ambient condition. Concentration of reactants varies along the length of reactor but not in radial direction. The set up consists of two feed tanks through which two reactants are fed to the reactor. The compressed air is used for circulation of feed. A straight tube type reactor kept horizontally and inclined upward at outlet from where samples are collected for analysis. Rotameters are provided to measure the individual flow of Chemicals. The flow rate can be adjusted by operating the needle valves provided on respective Rotameter. Pressure Regulator, Pressure Gauge and Safety Valve are fitted in the compressed air line. Saponification reaction study in straight tube Plug Flow Reactor. Instruments, Laboratory Glassware and Chemicals required for analysis as per the system adopted.. In an ideal Plug Flow Reactor (PFTR) there is no mixing in the direction of flow and complete mixing perpendicular to direction of flow. Concentration of reactants varies along the length of reactor but not in radial direction. This set-up is used to study a non-catalytic homogeneous reaction under ambient condition. The set up consists of two feed tanks through which two reactants are fed to the reactor. It is a helical coil tube type reactor. 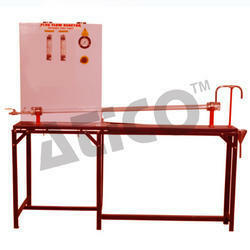 Rotameters are provided to measure the individual flow of Chemicals. The flow rate can be adjusted by operating the needle valves provided on respective Rotameter. The compressed air is used for circulation of feed. Samples are collected for analysis from the outlet of reactor. Pressure Regulator, Pressure Gauge and Safety Valve are fitted in the compressed air line. To determine Reaction Rate Constant. Pressure Gauge : Bourdon type 0-2 Kg/cm2. In an ideal Plug Flow Reactor (PFTR) there is no mixing in the direction of flow and complete mixing perpendicular to direction of flow. Concentration of reactants varies along the length of reactor but not in radial direction. This set-up is used to study a non-catalytic homogeneous reaction under ambient condition. The set up consists of two feed tanks through which two reactants are fed to the reactor. The flow rate can be adjusted by operating the valves provided on respective Peristaltic pumps. 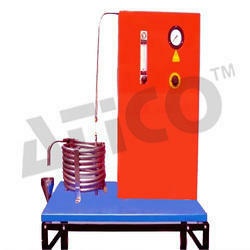 It is a helical coil tube type reactor. Reactants enter at lower end coming out of the top of coil from where samples are collected for analysis. Sponification Reaction Study in straight tube Plug Flow Reactor. Flow Measurement: Peristaltic Pumps, 2Nos. (One each for Reactants). Piping: Stainless Steel and Silicon Pipe. In an ideal Plug Flow Reactor (PFTR) there is no mixing in the direction of flow and complete mixing perpendicular to direction of flow. Concentration of reactants varies along the length of reactor but not in radial direction. This set-up is used to study a non-catalytic homogeneous reaction under ambient condition. The set up consists of two feed tanks through which two reactants are fed to the reactor. 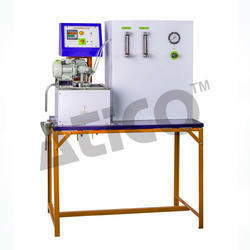 Peristaltic pumps are provided to measure the individual flow of Chemicals. The flow rate can be varied by changing the speed of peristaltic pump. Samples are collected for analysis from the outlet of reactor. Computer System: i-3 processor with DVD Drive, Windows 7/8, MS-Office pre-loaded. One USB slot required in PC for Data Acquisition Card.. Reactor : Material Stainless Steel, (0.6-0.7) Ltrs approx. Feed Tank : Material Stainless Steel (2Nos. ), Capacity 20 Ltrs. Product Analysis : By Electronic Sensor (1No. ), Output 4-20 mA.. In an ideal Plug Flow Reactor (PFTR) there is no mixing in the direction of flow and complete mixing perpendicular to direction of flow. Concentration of reactants varies along the length of reactor but not in radial direction. This set-up is used to study a non-catalytic homogeneous reaction under ambient condition. The set up consists of two feed tanks through which two reactants are fed to the reactor. 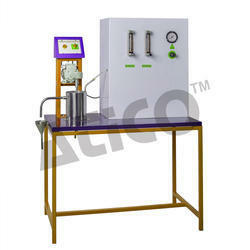 Peristaltic Pumps are provided to measure the individual flow of Chemicals. The flow rate can be adjusted by operating the needle valves provided on respective Peristaltic Pump. Samples are collected for analysis from the outlet of reactor. Sponification Reaction Study in coiled tube Plug Flow Reactor. Computer System: i-3 processor with DVD Drive, Windows 7/8, MS-Office pre-loaded. One USBNslot required in PC for Data Acquisition Card. Reactor : Material Stainless Steel, Capacity (0.6-0.7) Ltrs approx. Flow Measurement : Peristaltic Pump 2 Nos. (One each for Reactants). Product Analysis : By Electronic Sensor, Output 4-20 mA. In an ideal Plug Flow Reactor (PFTR) there is no mixing in the direction of flow and complete mixing perpendicular to direction of flow. Concentration of reactants varies along the length of reactor but not in radial direction. The flow rate can be adjusted by operating the needle valves provided on respective Rotameter. This set-up is used to study a non-catalytic homogeneous reaction under ambient condition. The set up consists of two overhead feed tanks through which two reactants are fed to the reactor. It is a helical coil tube type reactor. Reactants enter at lower end coming out of the top of coil from where samples are collected for analysis. In an ideal Plug Flow Reactor (PFTR) there is no mixing in the direction of flow and complete mixing In an ideal Plug Flow Reactor (PFTR) there is no mixing in the direction of flow and complete mixing perpendicular to direction of flow. It is a helical coil tube type reactor kept in a constant temperature water bath to conduct the experiment at various temperatures. Reactants enter at lower end coming out of the top of coil from where samples are collected for analysis. Concentration of reactants varies along the length of reactor but not in radial direction. In case of a coil turbulence is introduced due to frequent change in direction of flow and presence of secondary flow, so a higher value of reaction rate constant is expected in coil tube type plug flow reactor. This setup is used to study a non-catalytic homogeneous reaction under isothermal condition. The set up consists of two feed tanks through which two reactants are fed to the reactor. Peristaltic Pumps are provided to measure the individual flow of Chemicals. Sponification Reaction study in Isothermal Plug Flow Reactor. Flow Measurement : Peristaltic Pumps, 2Nos. (one each for Reactants). Temp. Measurement : Temperature transmitter-1No. RTD PT-100 type, Output 4-20 mA. In an ideal Plug Flow Reactor (PFTR) there is no mixing in the direction of flow and complete mixing perpendicular to direction of flow. Concentration of reactants varies along the length of reactor but not in radial direction. In case of a coil turbulence is introduced due to frequent change in direction of flow and presence of secondary flow, so a higher value of reaction rate constant is expected in coil tube type plug flow reactor. This set-up is used to study a non-catalytic homogeneous reaction under isothermal condition. The set up consists of two overhead feed tanks through which two reactants are fed to the reactor. The flow rate can be adjusted by operating the needle valves provided on respective Rotameter. It is a helical coil tube type reactor kept in a constant temperature water bath to conduct the experiment at various temperatures. Reactants enter at lower end coming out of the top of coil from where samples are collected for analysis. Flow Measurement : Rotameter- 2Nos. (One each for Reactants). Piping : Stainless Steel and PVC/PU pipe. Real reactors do not satisfy the idealized flow patterns, back mix flow or plug flow deviation from ideality can be due to channeling of fluid through the vessel, recycling of fluid within the vessel or due to the presence of stagnant region or pockets of fluid in the vessel. To predict the exact behavior of a vessel as a Chemicals reactor, RTD or stimulus response technique is used. The setup consists of one feed tank through which water is fed to the reactor. The flow rate can be adjusted by operating the needle valve and measured by Rotameter. The compressed air is used for circulation of feed. A straight tube type reactor kept horizontally and inclined upward at outlet from where samples are collected for analysis. For understanding the R.T.D. characteristics, a special arrangement to inject tracer into the lower end of reactor, using a syringe is provided. Pressure Regulator & Pressure Gauge are fitted in the compressed air line. Real reactors do not satisfy the idealized flow patterns, back mix flow or plug flow deviation from ideality can be due to channeling of fluid through the vessel, recycling of fluid within the vessel or due to the presence of stagnant region or pockets of fluid in the vessel. A straight tube type reactor kept horizontally and inclined upward at outlet from where samples are collected for analysis. For understanding the R.T.D. characteristics, a special arrangement to inject tracer into the lower end of reactor, using a syringe is provided. To predict the exact behaviour of a vessel as a Chemicals reactor, RTD or stimulus response technique is used. The set up consists of One feed tank through which water is fed to the reactor. Peristaltic pump is provided to circulate the feed. Product Analysis : By using Electronic Sensor, Output 4-20 mA..
Real reactors do not satisfy the idealized flow patterns, back mix flow or plug flow deviation from ideality can be due to channeling of fluid through the vessel, recycling of fluid within the vessel or due to the presence of stagnant region or pockets of fluid in the vessel. To predict the exact behaviour of a vessel as a Chemicals reactor, RTD or stimulus response technique is used. Piping : Material Stainless Steel and PU pipe. Real reactors do not satisfy the idealized flow patterns, back mix flow or plug flow deviation from ideality can be due to channeling of fluid through the vessel, recycling of fluid within the vessel or due to the presence of stagnant region or pockets of fluid in the vessel. It is a straight tube type plug flow reactor made up of glass. Samples are collected for analysis from the outlet of reactor. To predict the exact behavior of a vessel as a Chemicals reactor, RTD or stimulus response technique is used. The setup consists of one feed tank through which water is fed to the reactor. The flow rate can be changed by varying the speed of peristaltic pump. For understanding the R.T.D. characteristics, a special arrangement to inject tracer into the lower end of reactor, using a syringe is provided. Electricity supply: Single phase, 220 V AC, 50Hz, 5-15 Amp combined socket with earth connection. Piping : Material Stainless Steel and Silicon pipe. Real reactors do not satisfy the idealized flow patterns, back mix flow or plug flow deviation from ideality can be due to channeling of fluid through the vessel, recycling of fluid within the vessel or due to the presence of stagnant region or pockets of fluid in the vessel. The flow rate can be changed by varying the speed of peristaltic pump. It is a helical tube type reactor made of stainless steel. For understanding the R.T.D. characteristics, a special arrangement to inject tracer into the lower end of reactor, using a syringe is provided. To predict the exact behavior of a vessel as a Chemicals reactor, RTD or stimulus response technique is used. The setup consists of one feed tank through which water is fed to the reactor. Reactor : Material Borosilicate Glass, Capacity (0.6-0.7) Ltrs approx. Piping : Material Stainless Steel and PVC. The set up consists of two feed tanks through which two reactants are fed to the reactor. Rotameters are provided to measure the individual flow of Chemicals. The flow rate can be adjusted by operating the needle valves provided on respective Rotameter. The compressed air is used for circulation of feed. A straight tube type reactor kept horizontally and inclined upward at outlet from where samples are collected for analysis. Pressure Regulator, Pressure Gauge and Safety Valve are fitted in the compressed air line. In an ideal Plug Flow Reactor (PFTR) there is no mixing in the direction of flow and complete mixing perpendicular to direction of flow. Concentration of reactants varies along the length of reactor but not in radial direction. This set-up is used to study a non-catalytic homogeneous reaction under ambient condition. The flow rate can be adjusted by operating the needle valves provided on respective Rotameter. The compressed air is used for circulation of feed. Reactants from feed tanks enter in the first CSTR and are passed to second CSTR and so on. For analysis samples are collected from different ports provided. Pressure Regulator, Pressure Gauge and Safety Valve are fitted in the compressed air line. In an ideal CSTR (i.e. an ideal steady state flow reactor) the contents in reactor This set-up is used to study a non-catalytic homogeneous second order liquid phase reaction under ambient condition. The setup consists of three CSTR arranged in series and two feed tanks through which two reactants are fed to the reactor. Rotameters are provided to measure the individual flow of Chemicals. Stirrer (3Nos.) : Stainless Steel Impeller and shaft coupled with FHP Motor. The set up consists of two feed tanks through which two reactants are fed to the reactor. Rotameters are provided to measure the individual flow of Chemicals. The flow rate can be adjusted by operating the needle valves provided on respective Rotameter. The compressed air is used for circulation of feed. The CSTR is fitted with stirrer for proper mixing. From top outlet of it samples are collected for analysis. Pressure Regulator, Pressure Gauge and Safety Valve are fitted in the compressed air line. In an ideal CSTR (i.e. an ideal steady state flow reactor) the contents in reactor are well mixed and have uniform composition throughout. Thus the exit stream has the same composition as the fluid within the reactor. This type of reactor is known as mixed flow reactor. This set-up is used to study a non-catalytic homogeneous second order liquid phase reaction under ambient condition. 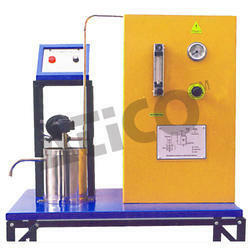 Reactor : Material Stainless Steel, Capacity 2 Ltrs (Approx). Stirrer : Stainless Steel Impeller and shaft coupled with FHP Motor. Feed Tank (2Nos.) : Material Stainless Steel, Capacity - 20 Ltrs. (Approx). Looking for Chemical Reaction Engineering Lab ?